This week has been awesome. One reason is that Corey is in visiting from Trinidad! Another reason is that Beth, Corey's bestie, just got engaged and we hosted a super fun bridal lingerie party organized by Corey. Here are some pics (mostly of food) as the others I can't publish as it would spoil the surprise for Beth's new hubby. I must say, Corey knows how to throw a great party. This very tasty food was both healthy and colorful, and provided just the right festive setting. Miss Bethany Wesson, the lovely bride-to-be! --> I've learned and refined more skills in the kitchen at the Star of Hope Women and Family Emergency Shelter - always a bonus! It's an amazing place to volunteer. --> I tried a new arm balance pose at yoga for the first time called Astavakrasana (Eight Angle Pose) - and nailed it on the first try on both sides! This is a really tricky one as you can see below, so it's pretty exciting. --> I FINALLY did King Pigeon on one side at yoga - after nearly two years of trying. Now for the other side! --> I'm really proud of Greg who has been working so very hard and is doing great things. No room for boring spices! Sumac as a spice comes from the berries of a wild bush that is native in all Mediterranean areas, especially in Sicily and southern Italy, and parts of the Middle East, notably Iran. It has also been naturalized to most of the United States, and was known to Native Americans. I’ve read somewhere that they would use it on their children to prevent bed-wetting. Interesting, no? 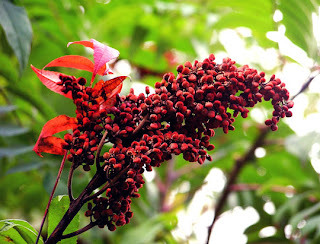 Sumac is a relative of poison ivy its leaves can cause painful skin reactions but its berries do not. 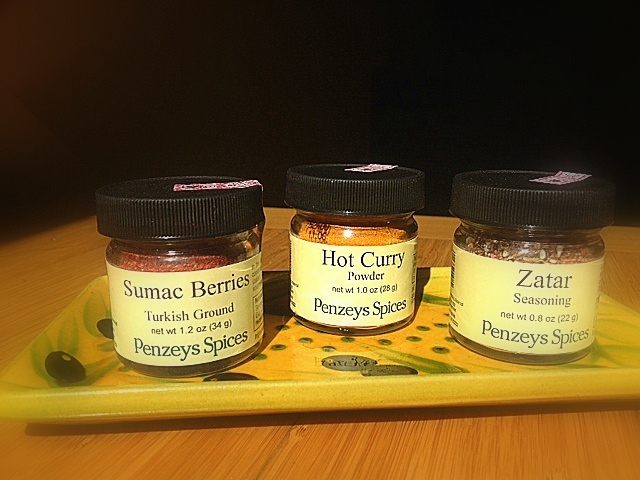 Sour and astringent, sumac berries are used in place of lemon peel in Lebanese and Turkish cooking. Sumac juice is added to salad dressings and marinades and the powdered form is used in stews and vegetable and chicken casseroles. A mixture of yogurt and sumac is often served with kebabs. Yum! I’ll be using it on fish, grilled veggies and in dressings. Now for zatar, or za’atar seasoning. This is probably one of the more underrated seasonings in my books. I like it because it's so COMPLICATED. It’s also high in anti-oxidants. In many cases it actually includes sumac. It’s spelled a lot of different ways. 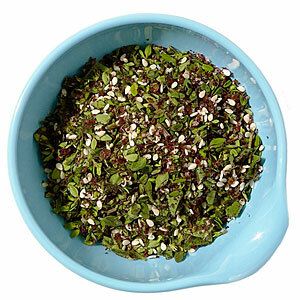 Za'atar is generally prepared using ground dried thyme, oregano, marjoram, and mixed with toasted sesame seeds, salt, and other spices such as sumac. 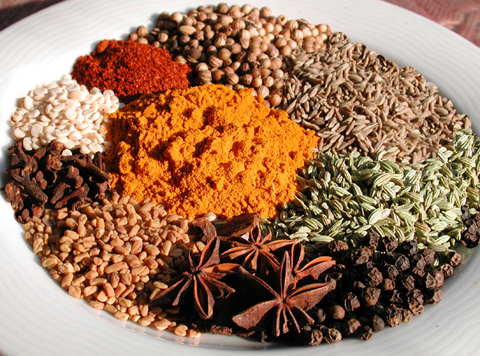 Some varieties include savory, cumin, coriander, or fennel seed. A Palestinian variation includes caraway seeds. Traditionally, housewives throughout the Fertile Crescent, Iraq and the Arabian peninsula made their own variations of za'atar, which was unknown in North Africa. It’s popular in Armenia, Iran, Egypt, Iraq, Israel, Jordan, Lebanon, Libya, Morocco, the Palestinian territories, Saudi Arabia, Syria, Tunisia, and Turkey. I use it in hummus, and in balsamic and oil bread dipping sauce. 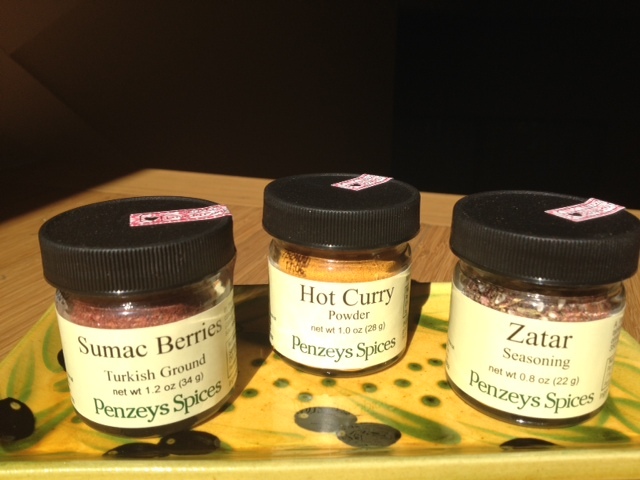 Hot curry powder is a standard in my kitchen. Remember that curry is a carefully layered blend of spices, so it's wonderfully limitless as a flavor profile. Many people however forget that curry gets stale, loses it flavor, and goes flat and sort of bitter over time. Nothing is more disappointing than a boring and bitter curry! I like to purchase the hotter curry powders because I can always temper them with other ingredients. I encourage you heartily as we're in full-on grilling season to seize bold and exotic spices such as these, marinate meats and vegetables with them and be unafraid! !